It seems like just yesterday I was writing my first Dairy Star article, still in a daze from the excitement of coronation and the state fair. Now my journey as Princess Kay is coming to an end. In a few weeks, I will be crowning the 65th Princess Kay of the Milky Way. While it will be bittersweet to pass on the crown, I am excited for the next young woman who will have the opportunity to serve Minnesota’s dairy community. I have traveled over 6,000 miles, attended 80 appearances, visited almost 30 counties and talked to over 1,500 school children. No two events have been the same, but at each event I have had the honor of representing the hard-working, humble and compassionate dairy farmers who have inspired me throughout my life. All of the classroom visits, media interviews, dairy days, parades, county fairs, Fuel Up to Play 60 events, presentations, camps and other appearances have added up to one amazing year. My favorite month of the entire year is here. For most people, August might mean uncomfortably hot weather, the end of summer, two-a-day sports practices or the start of the school year. August has always been about the fair. Growing up on a dairy farm, my family didn’t go on many vacations. But, we did make it to the Minnesota State Fair almost every year. The fair is no doubt a special place to me, but it is also a place enjoyed by thousands and thousands of people every year. For the past 64 years, Princess Kay has been a part of that. After spending 12 days at the state fair as Princess Kay, I can truthfully tell you that walking into the Dairy Building, through the Moo Booth or past the All You Can Drink Milk Stand gets people excited about dairy. The feeling, memories and values that the Princess Kay of the Milky Way program stirs up not only in the dairy community, but in thousands of fairgoers, is incredible. The tradition of Princess Kay of the Milky Way, started and supported by Minnesota’s dairy farmers, is one of the very best parts of the fair. While I may be hanging up my sash and retiring my crown after Aug. 22, I will never stop sharing my dairy story. From the 4-year-old who shared some not so glamorous facts about dairy farming to her preschool class, to serving Minnesota’s dairy community as Princess Kay, I have never hesitated to speak on behalf of dairy. Now, I have another chapter to add to my dairy story. Thank you, Minnesota’s dairy farmers, for the hard work you put in on your farm each and every day. It has truly been an honor to represent you. I have enjoyed having the opportunity to meet many of you throughout my time as Princess Kay. Your time is incredibly valuable, and I am grateful for all who have taken the time to share their own dairy stories. For the last time as the 64th Princess Kay of the Milky Way, thank you. It has been a great year. 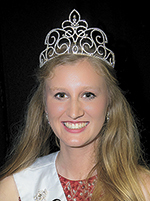 Princess Kay of the Milky Way, Emily Annexstad, serves as the Minnesota dairy community’s goodwill ambassador. Throughout the year, Princess Kay helps people understand the dedication of dairy farmers to wholesome and nutritious food, and the way milk is produced. Princess Kay does many school presentations, represents dairy farmers at the Fuel Up To Play 60 events that are held in conjunction with the Minnesota Vikings, and is very active during June Dairy Month sharing the importance of dairy farming and dairy foods. Emily and her family own and operate a dairy farm in St. Peter, Minnesota. She is a sophomore at the University of Minnesota studying animal science and agricultural communications and marketing. She enjoys reading, playing and watching sports, and showing cattle.